Karstdive 95 was a joint research and exploration project conducted by the Woodville Karst Plain Project (WKPP) and (SAD) in cooperation with the International Research and Application Center for Karst Water Resources (UKAM) of Hacettepe University, Ankara, Turkey, the University of Wyoming Department of Geology and Geophysics (UWG&G) of Wyoming, USA, the State Hydraulic Works (DSI) of Antalya, Turkey, and Kepez Electric Company also of Antalya. The goal was to explore, map, and document several underwater cave systems along the southern flank of the Taurus Mountains. Both UKAM and UWG&G were particularly interested in gaining a better understanding of the regional groundwater flow system near Antalya. DSI and Kepez Electric hoped to learn how to increase the water supply to the Antalya region. 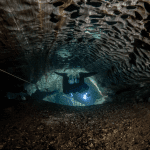 You can read more about the Karstdive Project in Dr. Todd Kincaid’s journal. Watch more DiveGUE.tv videos on InDepth. DiveGUE.tv was created to provide a supplementary educational platform for scuba diving enthusiasts. We believe these materials will increase global awareness of GUE training, thereby inspiring divers from around the world to establish and maintain a unified perspective, help ease diver anxiety, enhance class readiness, aid in skill maintenance, and encourage otherwise undecided or unsure divers to seek out training. 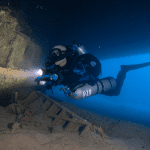 DiveGUE.tv is a production of Global Underwater Explorers (GUE), the 501(c)(3) nonprofit committed to high-quality diver education and to exploration and conservation of the world’s aquatic environments. Learn more. 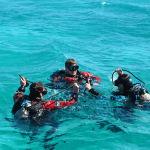 Global Underwater Explorers is building global communities of passionate divers, empowered by high-quality training, and organized to support wide-ranging diving activities. These communities contain and partner with dedicated explorers, conservationists, and scientific researchers to conduct a diversity of aquatic initiatives around the world. Let us bring diving right to your inbox. Sign up for our monthly newsletter so you never miss the latest from InDepth!